The Litmus Trio brought the season to a delightful conclusion. There was an accomplished performance of the Mozart, an absorbing account of the Beethoven and a breathtaking reading of the Fantasia." The unusual combination of flute, cello and piano has a surprising number of fine works written for it, and the Litmus Trio have performed trios by Bach, Haydn, Beethoven, Schubert and Mendelssohn, to name some of the greats. 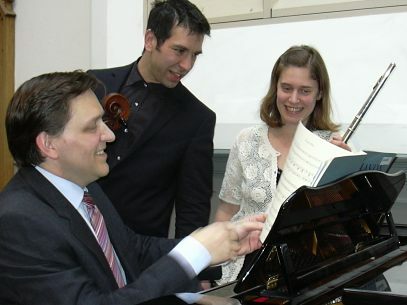 Their repertoire also contains lighter arrangements of popular works and this trio is always in demand. The Litmus Trio was formed in 1997 and since then has enjoyed a busy schedule of concerts each season playing for numerous music festivals and clubs and at major venues around the UK. The unusual combination of flute, cello and piano has a surprising number of fine works written for it, and the Litmus Trio have performed works by Bach, Haydn, Beethoven, Schubert and Mendelssohn, to name some of the greats. As well as this their repertoire also contains fascinating, rarely heard works by lesser known composers such as Weber and Martinu. The Litmus Trio have also made a significant number of lighter arrangements of popular works ensuring that this trio is always in demand. Peter Adams' career can truly be described as meteoric. When most musicians are still at school, the sixteen year old Peter was playing in the orchestra of London Festival Ballet. By the time he was 21 he had become principal cellist of both the London String Orchestra and the London City Ballet. Perhaps even more remarkably he became in the same year Professor of viola da gamba and baroque cello at the Royal Academy of Music - the youngest ever professor in the Academy's history. Peter appears as guest principal cellist with a variety of orchestras all over Britain and is the principal cellist of the Bournemouth Symphony Orchestra, English String Orchestra and the Oxford Philomusica. Peter Hewitt devotes his music making to chamber music and lieder as well as being a solo artist giving an average of 60 concerts each season. He regularly performs at the major London venues including the Purcell Room, Queen Elizabeth Hall, Purcell Room, St John's Smith Square and the Barbican. Peter's current ongoing recording project of the complete piano sonatas of Beethoven has attracted great critical acclaim. International Record Review magazine commented: "This is immensely musical and convincing Beethoven playing. Hewitt's technique is flawless. Here is the finest Beethoven piano sonatas debut disc I have heard in years; it deserves a place in every CD collection." He has recorded for BBC Radio and Television, broadcast on Radio 3, Classic FM, Australian Broadcasting Company, and New Zealand Radio.